19 October 2011 by J.M. 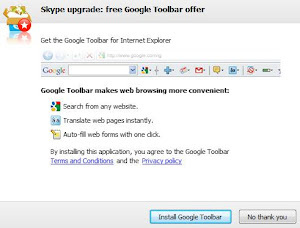 Skype had delivered its Windows installation file bundled with the Google toolbar, and offered Chrome upon updating. Skype’s Raul Liive explained that the partnership with Google has been quit. In this Skype release we have removed Google product offers from the Skype install flow. We have also released the same update for Skype 5.5 for Windows. By bundling its products with popular third-party software, Google tries to increase their popularity, like Google Chrome. Skype’s large user base has given Google a good chance to inform millions of Windows users about the alternative browser.